1.Perfect for bridal flowers, bridesmaid bouquet, Wedding party decorations, home decoration 2.Artificial white and purple flowers 3.Material:PU. 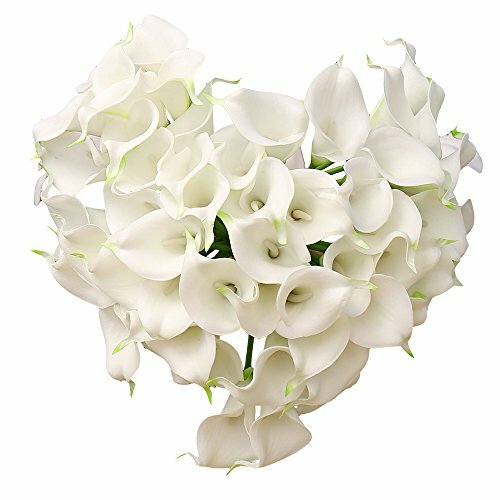 Primary Flower: Calla Lily 4.Size: 35cm high, 5cm flower head across (ABOUT) 5.Quantity:20pcs This package comes as 20 head bunches put together to make the 20 head bunch.good for wedding bouquets TIPS You get them with a simple package, please take care of it slightly, and if you feel a little smell,do not worry, it will disapeared when you take them out of the package one or two days. 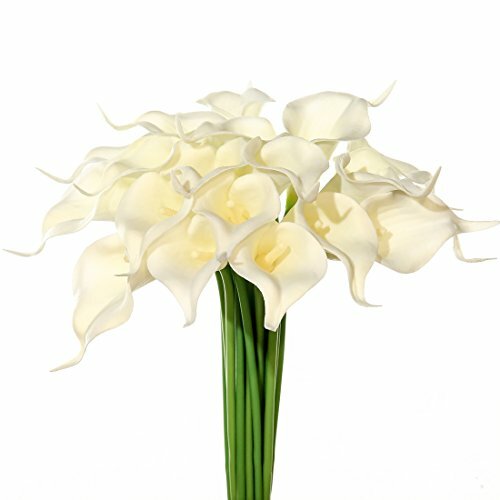 1.Material: Latex flower and flowers stems have wires inside;2.Color:sunset,white,red and pink;3.Size:total lenght about 1.12 feet;4.Quantity:20 pieces calla lily flowers;5.Scenes:looks real-like Great for home or venue decoration like wedding, shop, restaurant, office, etc Suitable for both indoor and outdoor use, creating a friendly ambience.Attention notice:✚✚Because the flowers are semi-hermetically sealed during transport, they smell a little bit when they are opened. Please leave the flowers in a well-ventilated area and the smells disappear in a matter of days.✚✚Please gently spread the item after getting it, in case of falling the leaves and flowers.✚✚There would be accumulated dust if you put it in a place for very long time.You can use the hair dryer with cold wind to remove the dust.✚✚If it was seriously dirty,you could sink it into salt water with high concentration for 10 minutes and then add neutral detergent and then rinse twice.✚✚Due to the difference on sunlight ,displays,configurations and diverse opinions on color,color shading is inevitable.✚✚Please don't put it under strong sunshine.You'd better to dry it by the natural wind. 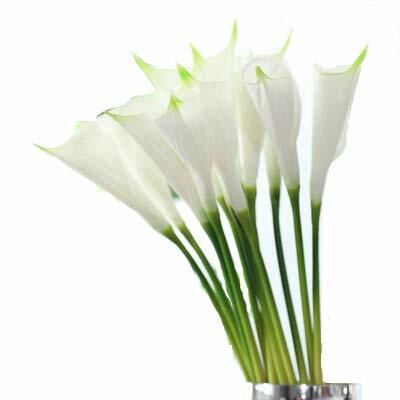 BETTER FLOWER,BETTER LIFE WE JUSTOYOU BETTER LIFE Artificial Latex Calla Lily Real Touch Blossom Flower Calla Lily Feature: 1,Made in Eco-friendly EVA plastic ,metal wire 2,Flexible stem but not easy to break off.You can freely bend or bob the branches to match your vase as you like. 3,Beautiful your wedding ,living room,house ,festival,party,etc decoration.Make our life more colorful and lifeful. 4,Never withered ,and keep fresh & lifelike long time even if you don't spend time to care them. 5,As is our friend,so is flower ,there can be joy in life ,when there are flowers. 6,If you are interested in our flowers,you can visit our store or search "JUSTOYOU" to find our other product. 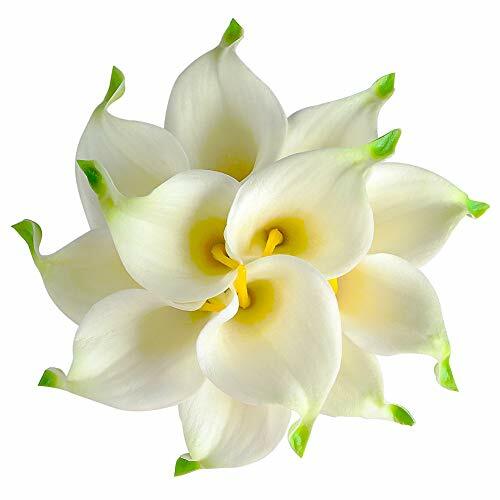 Attention Notice (About Cleaning): The latex calla lily flowers maybe be accumulated dust if you put it in a place very long time.You can wipe it with humid cloth . But don't put it into water and wash by hands ,it will hurt flower. Welcome To Our Flower Store ,We Wish You Very Good Lives. 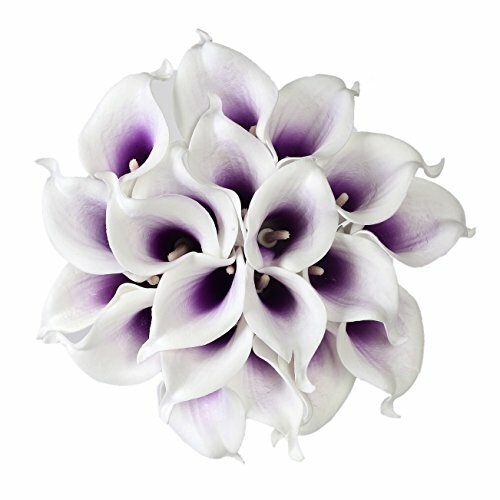 Our flowers are made of high quality PU rubber latex and are very easy to clean. 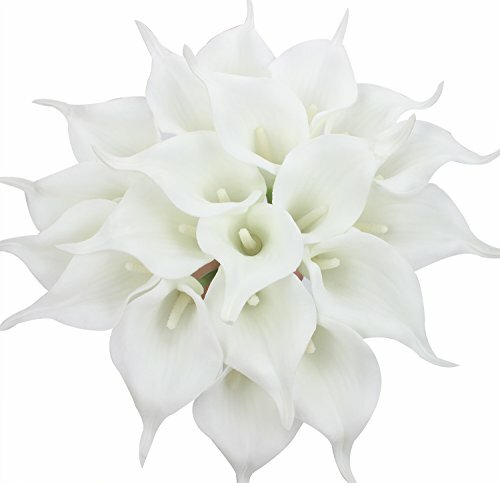 Ideal for placing in a vase, filling of center pieces or any part or holiday decoration. Flower Size: Total length including flower and stem: 25 inches. Flower bud approx size: 4 inches length, 1 inch across. Stems may be adjusted to your liking. Please note: The production of artificial flowers require many steps, many of which are 100% handmade . It may occur during transport that some delicate flower heads or leaves may briefly fall. If flower petals are bent, you may briefly submerge into very warm water to retain their original shape. Our artificial flowers can be easily clean. You may carefully wipe with a damp towel over it's surface. Vase not included. 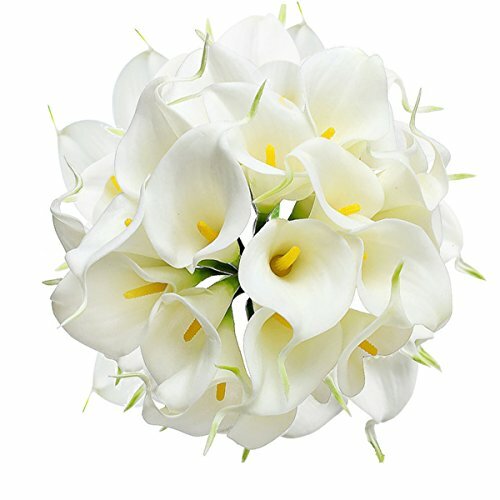 Looking for more White Artificial Calla Lilies similar ideas? Try to explore these searches: Spy Video Glasses, Sichuan Noodles, and Game Day Ohio State Football. 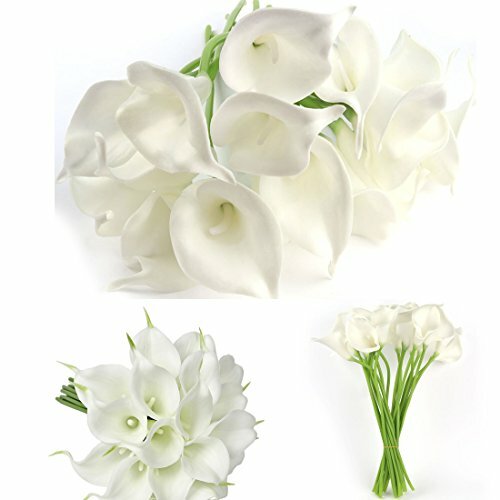 Look at latest related video about White Artificial Calla Lilies. Shopwizion.com is the smartest way for online shopping: compare prices of leading online shops for best deals around the web. 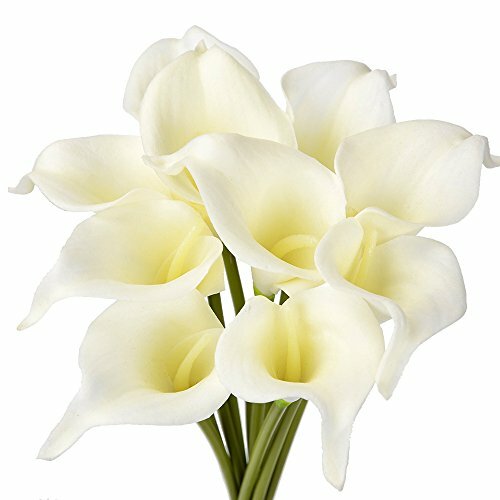 Don't miss TOP White Artificial Calla Lilies deals, updated daily.